Review of The Perfect Crime Hollow Point | Beer Apprentice - Craft Beer News, Reviews, Interviews and Info. ← Review of Fantome Boo! What’s up guys? Thanks for checking back in on another craft beer review. Today I’m going to be trying The Perfect Crime Hollow Point made by Scheldebrouwerij located in Meer, Belgium. I tried The Perfect Crime Smoking Gun a few months ago and I really enjoyed it, so I’m pretty excited about giving this one a go. No specific information about this beer was provided on their website, scheldebrouwerij.nl, so let’s jump over to ratebeer.com and see if we can’t find a description. This beverage came in an 11.2 oz. bottle and it had an ABV of 10.0%. It poured a hazy, deep caramel/brown color with a “dirty” white head. It was rather small and the retention time was slight. The lacing was thin too, but I could see quite a bit of clear alcohol sticking to the sides of the chalice as I tilted it from side to side. The aroma was very nice I thought. Tones of dark fruit. Figs, plum and raisin. A noticeable waft of booze along with a sturdy Belgian yeast characteristic. I also discovered smells of freshly baked wheat bread, sweet caramel and spicy clove. Very proper and solid. The taste was more of the same. Sweet, dark fruits as well as additional savors of caramel sugars, yeast and fresh breads. The alcohol was noticed again too, but it seemed to be a bit more harmonious in the taste than it was in the bouquet. As the brew warmed the clove became more defined and I also found a nice little almondy/nutty flavor. The mouthfeel was medium bodied. Mostly smooth, chewy and dry. The carbonation was of medium strength and a touch of warmth was felt from the alcohol. A very nice dose of goodness was left on the palate after each sip as well. Overall, I thought this was a very, very nice Quad. 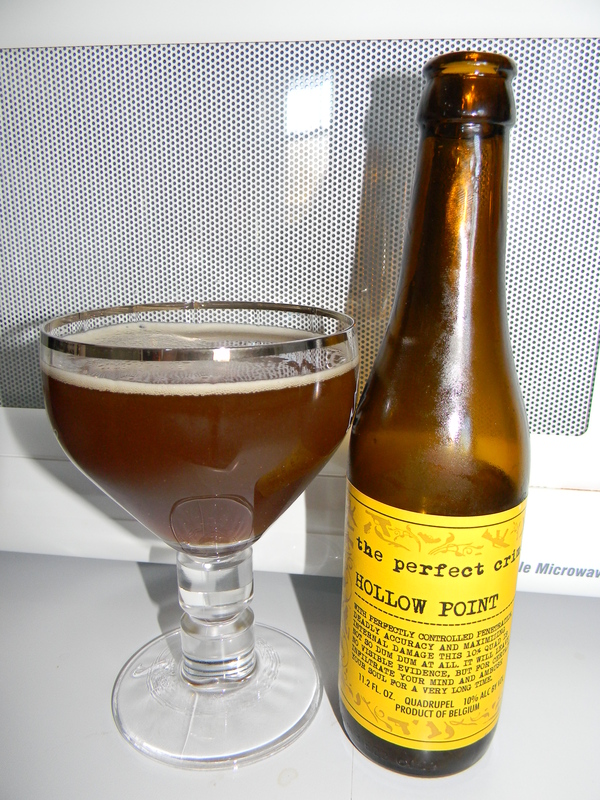 It’s not quite at the level of the Westvleteren, St. Bernardus or Rochefort in my opinion, but The Perfect Crime Hollow Point is a very easy and proper drink that would be a great substitute. I really doubt that you guys would be disappointed with it. I know I wasn’t and I would have absolutely no problem at all drinking this again. If you like Quads definitely give it a try and be sure to let me know what you think.